It is not often that people like Ray Scott come around and as such they should be recognized for the kind, warm people they are. 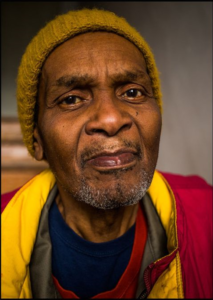 Ray was one of our elderly guests and had been dealing with homelessness for several years. He was known around town for the shopping cart he pushed that held all of his belongings. While Ray was at MBK, we learned that he was a devoted father, brother, grandfather, and uncle. Ray was also a friend to many in the community. In regards to his personality, Ray was a quiet man who was an avid reader of the bible and took pleasure in talking about Jesus. In fact, on our 1st Warm Heart Giveaway, a reporter asked Ray to write down what he was thankful for and in response he wrote “Family, MBK and Jesus”. Unfortunately, this award is posthumous as Ray died last year still experiencing homelessness. Rest in peace Ray! MBK will always love you.